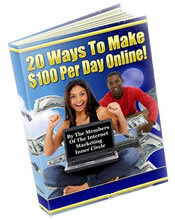 Do you want a constant stream of free traffic? Do you want to make sales on autopilot? the habit of producing at least 1 video/week. 4. I generate sales from the new subscibers to my e-course. 5. The whole system above is hand's free (runs on autopilot). free traffic, leads and sales? will rank easier and faster than an optimized web page. large list of leads. As your list grows so will your sales. instead of simply scanning the page content. conduct interviews or demonstrate how a product works. second position. The amount of traffic degrades from there. and by 78% and 58% for the subsequent pages. leads and sales you're leaving a lot of money on the table. Does your Web Site Sell? Is it in need of a makeover? your marketing funnel has been optimized correctly. So what are the Top 4 YouTube ranking factors? way through. If not, change the style of your videos. your video while they are watching it. get more traffic, leads and sales. essential marketing strategy to attract traffic to your site. search engines before it is submitted. Here is what you will receive in the package. and republish it - extra costs involved with doing this). take several weeks (or months) for web sites to get listed. and publishers your content to article directories. a friend to help them with their online business.